Hello, and welcome to the Week 13 Actual Opportunity report. 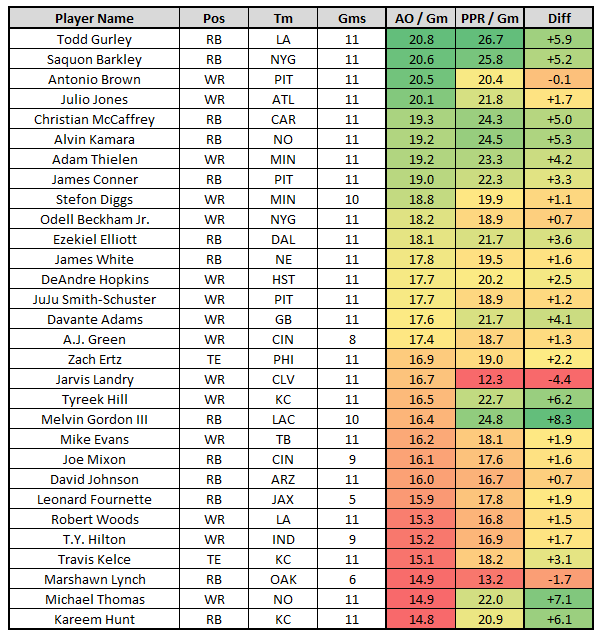 This is our weekly look at the players with the most fantasy potential based on volume, and how effective they’ve been with it. If you’re unfamiliar with Actual Opportunity, you can read the in-depth explanation here. With Jack Doyle now on IR, it’s time we embraced Ebron as a high-end TE1 (if you weren’t doing so already). Despite splitting time with Doyle in over half of his games, Ebron averages 17.7 actual fantasy points per game this year. That number ranks third-most among tight ends and 22nd among all receivers. When Doyle was active, Ebron averaged only 4.4 targets per game, 20.2 routes run per game, and 9.9 expected fantasy points per game, but with Doyle out, those numbers jump to 9.6, 37.8, and 18.0, respectively. Those numbers would rank second, first, and first among all tight ends. And 18.0 expected fantasy points isn’t just best among all tight ends (by 1.1 points), but it would rank sixth-best among all receivers. After weeks of chasing Landry’s volume, I finally gave up in Week 9, writing, “I’m calling it quits with Landry – I’m no longer bullish on a regression to a mean, and rather, suspect he’ll continue to underachieve relative to expectations.” It seems I wasn’t the only one who gave up on him either – so too did Baker Mayfield and new OC Freddie Kitchens. Before Week 9, Landry was averaging 19.6 expected fantasy points per game. Since then, he’s seen his three worst games in terms of expected fantasy points, with outputs of 10.4 (Week 9), 8.6 (Week 10), and 7.8 (Week 12). The offense has been better off for it too, with Mayfield’s passer rating jumping from 78.9 to 129.5 over this stretch. For some historical perspective, Landry’s per-game differential (-4.4) ranks fourth-worst among all 50-target wide receivers this past decade.